Language Discourse- A Critical Analysis of Michel Focault's Work on Language Discourse with Special Reference to His Masterpiece "The Archeology of Knowledge"
Discourse generally refers to "written or spoken communication or debate". The following are three more specific definitions: (1) In semantics and discourse analysis: A generalization of the concept of conversation to all modalities and contexts. (2) "The totality of codified linguistic usages attached to a given type of social practice. (E.g. 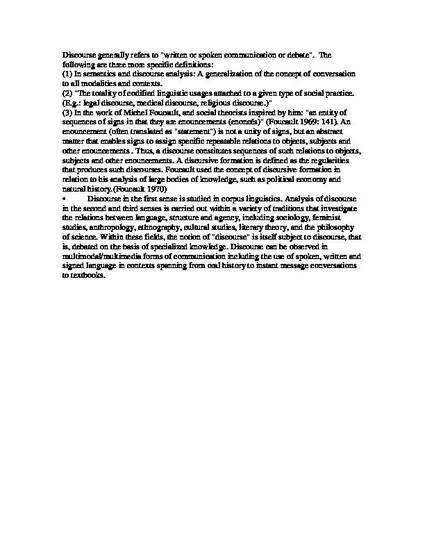 : legal discourse, medical discourse, religious discourse.)" (3) In the work of Michel Foucault, and social theorists inspired by him: "an entity of sequences of signs in that they are enouncements (enoncés)" (Foucault 1969: 141). An enouncement (often translated as "statement") is not a unity of signs, but an abstract matter that enables signs to assign specific repeatable relations to objects, subjects and other enouncements . Thus, a discourse constitutes sequences of such relations to objects, subjects and other enouncements. A discursive formation is defined as the regularities that produces such discourses. Foucault used the concept of discursive formation in relation to his analysis of large bodies of knowledge, such as political economy and natural history. (Foucault 1970) •	Discourse in the first sense is studied in corpus linguistics. Analysis of discourse in the second and third senses is carried out within a variety of traditions that investigate the relations between language, structure and agency, including sociology, feminist studies, anthropology, ethnography, cultural studies, literary theory, and the philosophy of science. Within these fields, the notion of "discourse" is itself subject to discourse, that is, debated on the basis of specialized knowledge. Discourse can be observed in multimodal/multimedia forms of communication including the use of spoken, written and signed language in contexts spanning from oral history to instant message conversations to textbooks.